Enriched with vast industrial experience, we are involved in offering a wide range of Medical Report Covers. 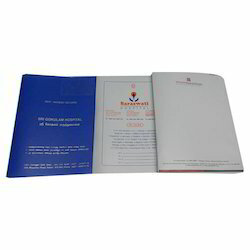 This Printed Doctor File is designed as a document storage folder or a carry away or conference folders. It has two pockets on either side to carry your A/4 sized papers. It has a pouch for visiting cards and elastic band slots for holding a pen. The folder is light weight being made of premium stiff boards. Printing onto plastics (Polypropylene-PP) can be done in a number of ways dependent on the product required. Printing onto rigid plastic sheets is usually done on a special litho press set up for UV printing. Unlike conventional printing presses, UV printing onto plastics requires special inks and chemicals as well as an ultra violet drying unit. As a central entity of this domain, we offer the best grade of Hospital Patient File. - Size: A5Color: Yellow, Green, Pink, Orange, Blue etc. Color Available: Blue, Red, Black etc. Hospital files With Multicolour Printing with clip & pocket inside specially designed as client requriments.Available in varied colors and sizes our range can be availed in bulk quantities as well. We are among the top organizations, engaged in offering Hospital Record Document Files. These are vary strong and durable. Latest machines and modern techniques are adopted by our vendors to manufacture these files. 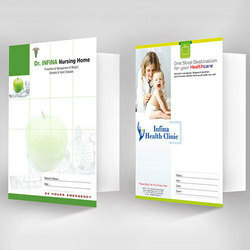 We are one of the most reliable companies in this domain and are into offering Printed Patient File Folder.